Did the Greek philosopher foresee the demise of the mainstream media? The most famous image in the history of philosophy comes to us from Plato. In his immortal work The Republic, the philosopher asks us to imagine a group of people who have lived all their lives inside a cave. They are chained to the spot, facing a blank wall, unable to turn their heads. Behind them, on a raised walkway, burns a fire, in front of which pass men carrying all sorts of objects – vessels, figures of people and of animals made of various materials. Some of the men are talking as they pass, others are silent. The fire projects shadows of these objects onto the wall, so all the prisoners can see is a perpetual parade of moving shadows. Behind the fire is a path leading upwards to the exit from the cave. It is lit by diffused light from the sun poking through the doorway. If, says Plato, any of the prisoners are suddenly freed from their shackles, it will hurt them to turn their heads. They will look at the fire and be dazzled. If their liberator points to the objects being carried along the walkway, saying that they are the real objects casting the shadows, the newly freed men will not believe him. They will not know what they are looking at. If one of the freedmen is dragged up the path to the exit, he will be confused and bewildered. Should he go into the world outside the cave, he will not at first know what he is looking at. It will take a long time for his eyesight to adjust, until eventually he will be able to look at objects in direct sunlight and then even at the sun itself, which will dazzle him but in a different way. He will seethe sun as the true giver of life and light to all things. And should he return to the cave out of pity for his fellows still in chains there, the shadows he once thought were reality will appear as they truly are, mere projections of objects that themselves have little substance except as creations of men, illuminated by a poor substitute for the sun that has itself been fashioned by human hands. Moreover, were he to seek to liberate the remaining prisoners, hoping to point them to the reality outside the cave, they would think him insane and put him to death. Such, thought Plato sorrowfully, was the price to be paid by anyone who sought to point his fellow men towards the truth. As the journalist and politician Clare Boothe Luce used to say, no good deed goes unpunished. How correct this is when applied to journalism, where it is generally safer to focus on the shadows than the light. Love of truth should be the standard for all journalists, and not mere truth but the truth that matters. One might spend a career reporting the truth about objects that cast shadows whilst ignoring the sun that is the source of all light. There is, as it were, truth and Truth, or better truths and Truth, and to say that the role of the journalist is to report truths is as erroneous as to suggest that he should report about whatever people happen to be interested in. Well, Pontius Pilate scoffed ‘What is Truth?’ and would not stay for an answer. No doubt many journalists think likewise, and with some justification. As a lapsed member of the Chartered Institute of Journalists, having written many opinion pieces (as opposed to reportage) for newspapers and magazines, I too have wondered whether, among all the rubble strewn through the pages and screens of the media, it is possible to get to the heart of how things are in the world. One of the reasons I stopped writing opinion pieces (though this is not a perpetual vow) was because I wondered whether it made one bit of difference whether I said this or that when you could always find another journalist, sometimes on the same page, saying that or this, and given that only one page after my saying this or that one could read a flesh-creeper about how the world was going to end followed by a sober reflection on how it wasn’t really going to end but that we all needed to remain vigilant. Amid the cacophony one tends to wonder, ‘Who cares?’ It’s not as though newspaper articles, for instance, are page-ordered by priority in the search for truth, and you will not have any help from Google News in this regard, where you’re as likely to find a story about Tiger Woods in the top left corner as one about the global financial crisis. It is not just the media clatter which made me slow down in my efforts to provide the world with the benefits of yet another opinion, but the whimsy of people’s reactions to what journalists tell them. One particular incident caused me to pause, reflect, and put away my keyboard. Several years ago I published an article in the San Francisco Chronicle in the wake of the research fraud by disgraced stem cell scientist Hwang Woo Suk of South Korea. I criticized embryonic stem cell research in general and argued for a kind of separation of Science and State, with the government needing to pull back from funding what has become a secular priesthood. The article was reproduced all over the Net, with comments, reactions, and follow-ups. Not long after, I published another article in the same newspaper detailing – as far as I know for the first time in the press – the massive logistical enterprise undertaken by the US government of relocating tens of thousands of persecuted Meshket Turks from south-west Russia to the United States. There was no apparent gain to the government in terms of foreign policy; it was simply a humanitarian gesture toward a people who were reviled by their neighbours and forsaken by the rest of the world. The State Department, from whom I obtained some background information for the story, were, it is fair to say, astonished that anyone would publish an article praising something they had done, with no sting in the tail, no backhanded criticism to round off the account. The reaction to the story? Nothing. Deafening silence. It has not, to my knowledge, been reproduced anywhere on the Net, nor has it attracted a single comment. Why? All I could deduce was that the stem cell story was hot news, a ‘shock horror’ saga that forced a reaction whether on my side or by the embattled defenders of stem cell research trying to make excuses. The Meshket Turk story, however, was deemed not newsworthy, and even if it was its author had the temerity of praising the US government – under George W. Bush, to add insult to injury. Had I written a story attacking US government policy on this or that, the reaction would, I am sure, have been significant. But to praise that government: who wanted to hear about that? What this points to, in my view, is a complicity by the public in the indifferentism with which things are reported. I say ‘things’ rather than ‘news’ because so much of what is reported is not news in any respectable sense of that term. I won’t even begin to try to isolate cause and effect in this process. Does media indifferentism cause the public to have a flighty, sparrow-like attitude towards what is reported, where a celebrity face lift is no more or less interesting and important than a bank failure? Or does the indifferentism of the public, built up over decades of cultural and moral fragmentation, cause the media to pander to its skittishness? It is probably a little of both, but the way things are it is marginally more likely that the media can change the public than the other way around. Another name for the frankly anarchic way in which things are reported derives from theological circles – syncretism. Just as critics of syncretism in religion decry the idea that any religion is as good and true as any other, so syncretism in the media could be described as the attitude that any ‘story’ is as good as any other. Not even the so-called respectable broadsheets or the UK state broadcaster are immune from syncretism, given that show business tittle-tattle is as likely to appear as the lead story as something genuinely worth reporting, or – even worse – alongside it. This commingling of shadow and substance, of the solid and the vaporous, points back to the problem of truth. The problem is multi-faceted, therefore it is facile to criticize the media, as many do, simply for confusing fact with fiction. This is only one aspect. There is also the aspect that involves reporting facts not worth knowing. Most facts fall into this category. There is the closely related issue, not of reporting facts not worth knowing pure and simple – though they are not – but of reporting them as though they were facts worth knowing. Again, there is the non-reporting of facts worth knowing and the related sins of omission that make one wonder whether the expression ‘to cover the news’ was the quite deliberate invention of a wittily subversive journalist. To which one can conjoin the double-transgression of omission and commission combined in the suppression of facts worth knowing. That there is a problem of truth for the media does not mean that truth is a problem for the media. The media might ‘have a problem’ with the truth, to use the pop-psychological jargon, but that doesn’t make truth a problem. On the contrary, the only problem truth presents is that of how to love it enough. Truth is there to be loved; it is wholly and unconditionally lovable. It has no spot or wrinkle. For Plato, inspiration to seekers after wisdom everywhere –not just philosophers – truth, or Truth, is the final, perfect objective of the human mind. Plato speaks often in an almost mystical way of uniting oneself with Truth, of becoming one with it through a kind direct perception or intuition. The Neo-Platonists are even more explicit in this quasi-religious understanding of Truth as the only thing that can fully satisfy the human soul. On the more mundane level, truth is that which alone can fulfil the human intellect with its inherent, ineradicable rationality. Leaving aside pure opinion or comment, there can be nothing else for a journalist to have any professional interest in but presenting the truth: not pleasing his editors; not amusing the public; not paying obeisance to government; nor pandering to advertisers and other corporate influences. If one has no interest in speaking the truth, or is not allowed to, or is forced into the insidious self-censorship that infects the media from top to bottom, then what is the point of being a journalist? Why bother, when there are so many equally satisfying and less morally onerous professions in which to engage? 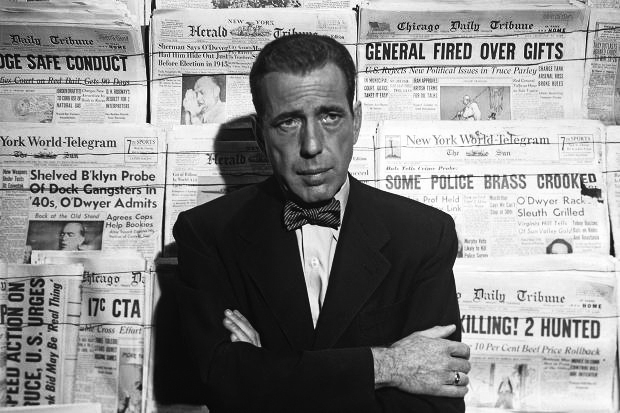 Humphrey Bogart in Deadline U.S.A. Many in the mainstream media regard the pronouncement of its demise to be as premature as the infamous false report of Mark Twain’s death. By ‘mainstream media’ I mean those newspapers, radio and television channels that predate the Internet revolution and are commonly regarded as the bastions of traditional, trustworthy reportage. If they are not state broadcasters then they are almost100% corporate owned. They are the sources people feel safe to trust when they make factual claims. Yet these traditional pillars of reportage are crumbling. The Boston Globe is on the brink of bankruptcy. Since 1998, the circulation of the New York Times has declined by 17%. Two years ago the Chicago Tribune filed for bankruptcy protection. The three major network nightly news programmes in the US have seen total decline in viewers of nearly one third since 2000. The situation is hardly better in the UK. Former news reporters and anchors blame media consolidation, the Internet, a decline in quality, too many stations to choose from (though nearly all owned by the same handful of companies), among other reasons. It is not hard to see the Internet as a major force in this decline, as it has opened up journalism – of highly mixed quality, needless to say – to anyone with a computer and an ISP. Give people more choice and they will use it. On the other hand, a sheer decline in reporting quality and trustworthiness within the mainstream media has also led people to vote with their feet – or rather eyes and ears. It is not as though the public have suddenly discovered a distaste for celebrity tittle-tattle masquerading as news, though their disdain for so-called ‘celebrity culture’ itself, as shown up repeatedly in polls, suggests that maybe people consider such intellectual junk food to be a guilty pleasure that causes them to rebel, at least internally, against their providers. It is also true to say that a large part of the loss in paid circulation and television viewership has been translated into people’s consuming the same content, from the same organizations, over the Internet. There it is largely free, which is perhaps what many people think that content is worth. We are yet to see the outcome of Rupert Murdoch’s plan to start charging aggressively for online content, but it is hard to imagine that it will meet with great success. Still, there is clearly a distrust that has been sown in the public of the mainstream media’s willingness to report accurately on what matters, or even to report everything that needs to be reported. In a 2009 study, Pew Research claimed that only 29% of Americans thought that news organizations got their facts right, with 63% saying that news stories are often inaccurate. In the first such survey by Pew, dated 1985, 55% said that news stories were generally accurate and only 34% said they were inaccurate. It does not take much perusing of media accuracy websites to see why this is so. And one need only browse through the archives of Project Censored to determine the extent to which important stories are either suppressed or downplayed by the mainstream media. What I propose to do for the rest of this discussion is to go through some categories of activity that contribute towards the general malaise felt about the quality and reliability of reporting by the mainstream media. All of them, in one way or another, offend against that Platonic love of Truth which should animate the soul of any self-respecting journalist with a modicum of pride in what he does for a living. Taken together, they represent that flight to the shadows which, should alternative sources of news and information be shut down in some future state pincer movement on the Internet, destines millions of cave dwellers to their unilluminating fate. I will say nothing more about those non-stories that titillate the public and serve to drag our social and private morality ever lower, whether they concern man biting dog, celebrity Botox, adultery at the nineteenth hole or punch-ups at the Christmas pantomime. The present category concerns something far more insidious, what I call the reporting of mental states rather than public actions and events. Now sometimes it is important to report someone’s mental state, for instance that the Prime Minister intends to call an election in May, or that the President has decided to increase troops in Afghanistan. But in the vast majority of cases, the reporting of mere mental states is intrinsically not newsworthy. A simple test reveals the sheer quantity of these non-news items in the media. I take as an example, with no bias intended and in no special order, some stories from mainstream media outlets on Google News as of 20 February 2010. (1) Detectives ‘think’ that a bailed crime suspect fled abroad (The Times). (2) Police ‘fear’ the increase in children taking driving lessons (BBC News). (3) There are ‘fears’ of a double-dip recession in the UK following a sharp fall in retail sales (The Times). (4) The town Toyota built ‘hopes’ US fightback can jump start economy(The Independent). (5) Elton John ‘thinks’ Jesus was gay (The New York Magazine). (6) Ernie Els ‘thinks’ Tiger Woods is upstaging tournament (Detroit Free Press). (7) President Obama ‘loves’ Las Vegas (CBS News). (8) ‘Fears’ over economic revival rise (Daily Mail). The list could go on, but the theme is clear: if you report a mere mental state, you have a story. Why? What does it matter whether someone fears something, wants something, hopes for something, likes something, thinks something, if it is not accompanied by an actual event or action of a public nature that has a potential impact on society? In which case the mental state drops out and all that matters, for public news purposes, is the action or event. This is a paradigmatic example of non-news pretending to be news. Closely connected, of course, are those non-news items consisting of reports of the future or of what might or is likely to happen. Some examples. (1) ‘British Airways crew likely to vote for strike’ (The Telegraph). (2) ‘Rail passengers set for disruption as conductors’ strike gets under way’ (The Scotsman). (3) ‘David Cameron may struggle to disguise his dinosaurs in casual shirts’ (The Guardian). (4) ‘There may be fewer great white sharks than endangered tigers’ (Daily Mirror). (5) ‘Andrew Lloyd Webber may buy Abbey Road studios’ (The Guardian). (6) ‘Obama most likely to visit India later this year’ (Press Trust of India). (7) ‘Pilot possibly angered by contract-worker tax issue’ (Wall Street Journal). And so on ad nauseam. There might, in such cases, be some newsworthiness, but only if the hypotheses, speculations, and predictions are tied to actual events and actions, such as a vote or a decision by someone. But then why not just report the vote or the decision? Why speculate about whether or how likely it is to happen, or whether it may or is likely to lead to something? Anyone can speculate about anything, but reporters are supposed to report, not to speculate. Possibilities and probabilities are not facts, except in specific contexts such as a piece of scientific research. They should be confined to such. This category might seem a little harsh, since reports can be newsworthy, say if an influential government or scientific body, which is likely to be listened to, reports on something of importance. Generally speaking, however, reports of reports are of scant news value when compared to reports of actions and events. Newspapers report that other newspapers have reported something, so they don’t appear to have missed the story. Radio and television report newspaper reports because they get many of their stories by scanning that morning’s newspapers. Further, the media cannot resist reporting every report on just about every subject, with no sense of discrimination as to which report is important, which bodies issuing their reports have the most credibility, which ones have track records of having their conclusions and recommendations implemented by anyone, and so on. All of this simply adds to the cacophony and indifferentism that leads the public to think every report is as worthwhile as every other, that each one will be acted upon somewhere, sometime. If a report from some think-tank, for instance, states that children’s obesity must be tackled urgently, and if the body is described as ‘influential’, then the natural conclusion is that it will be listened to by the government and the problem will be solved. Which it rarely if ever is, any more than the endless stream of reports on crime, drugs, social disorder, poverty, declining educational standards, teenage promiscuity, and so on ad infinitum. One can imagine Plato decrying reports of reports as the worst form of imitation, a turning away from reality and into the world of insubstantial, fleeting apparitions. It might bethought that the media never consciously omits to report anything of importance. This is hard to square with reality, however. I will start with one of the most egregious, if not the worst, such case. Every year, the Bilderberg Group meets in some luxury hotel, somewhere around the world. Ask the person on the street who the Bilderberg Group is, and they probably won’t have a clue. They are more likely to, however – especially in Continental Europe and the USA– than they would have been a couple of decades ago, almost exclusively thanks to the intrepid reporting of journalists well outside the mainstream, such as Jim Tucker and Daniel Estulin, and the alternative broadcaster and film-maker, Alex Jones. I wonder how many of you in this room have ever reported on the Bilderberg Group? Formed in 1954,it is an annual meeting of over one hundred of the elite’s elite – politicians(including current and former heads of state, prime ministers, presidents, all the way down to up- and-coming leaders whose potential has been recognized by the organizers, such as Tony Blair in 1993), heads of multinationals, economists, scientists and other academics, aristocracy, professionals at the top of their fields, chiefs and senior editors of the largest media conglomerates, and the richest people on the planet. They meet for several days, under Chatham House Rules, as well as the tightest security imaginable, to discuss the problems of the world and how to solve them. There are no official proceedings or reports of what is discussed, only occasional brief communiqués and press releases which serve more to tantalise than to satisfy the understandable curiosity of the outside world. Compare this to, say, the World Economic Forum in Davos, or the various G meetings, which are reported on in depth by the mainstream media. Why the secrecy over Bilderberg? Attenders occasionally admit to attending, or make one or two comments about it in interviews, but never talk about what was discussed, whether any decisions were taken, resolutions made, and the like. As to coverage outside the alternative media, consider the following. The 2009 meeting was held in Athens from 14-16 May. I did a Google News search of contemporaneous mainstream media reports, by which I mean reports that were picked up by Google during the whole of May, trawling through the first ten web pages of the search, ten items per page. This revealed the following mainstream media reports: (1) ‘World’s elite meet secretly in Athens’ (Edmonton Sun); (2) ‘Greek nationalists protest Bilderberg club meeting’ (ABC News); (3) ‘VIPs at secret summit’ (Sunday Express);(4) ‘Shadowy Bilderberg group meet in Greece’ (The Times). You can add a small handful of non-English mainstream outlets and still find that not even ten percent of the one hundred stories I found consisted of contemporaneous, mainstream reports on Bilderberg. Every year, the local and regional media –that is, the outlets close to the venue of the annual meeting – report on it, and sometimes the national media of the country in which it takes place. That the meeting occurs is hardly a secret, even though it is undoubtedly a secret meeting. Through the laborious, decades-long cultivation of sources by Tucker and others, the list of attenders is always obtained and published by the alternative media, whose reports made up the bulk of the one hundred stories in my search. So why the bashfulness of the mainstream media? Why are their reporters never found protesting outside the six-star hotel venues, demanding a release of the proceedings? Editors and chiefs of major media organizations regularly attend, so it is not as though the mainstream media could not possibly know that the meetings take place and are certainly at the highest level, involving the world’s elite. At best it is negligent omission, at worst the deliberate withholding of information that clearly matters. One could multiply examples. The mainstream media’s coverage of Climategate has been abysmally thin. Throughout the first two weeks of the scandal I scanned the media headlines and found the reporting to be thin, apologetic, and full of omissions. I had to turn to the alternative media and the occasional intrepid mainstream journalists such as Telegraph blogger James Delingpole for the full story. Why should anyone have to do that? The alternative media can be notoriously unreliable and hyperbolic, lacking as it is in the resources to put hundreds of reporters on the ground, send cameras into the field, and write up compelling articles, let alone find outlets for its information outside the Internet and satellite radio. This lack of funding and personnel tends to be replaced by louder voices and a high level of shrillness. Yet all too often I have to turn to them for the facts, which obliges me to filter out much noise in the process. As well as the omission involved in not reporting something newsworthy, whether through negligence or intentionally, there is the active suppression of news. Perhaps this and the previous category, since they substantially overlap, should be counted as one. I am separating them because I think of the withholding of information as something like the decision not to report something where the person making the decision has general knowledge of the principal facts. Suppression involves the deliberate spiking of stories that are known in some detail, whether through a piece submitted to an editor but intentionally not published because of that editor’s decision not to run the story, or through a reporting of the story by other outlets, so that the ones not running it can be presumed to know about it at length but to have decided to ignore it. Project Censored, run from Sonoma State University in California, is one of the longest-running media censorship research programmes, and provides as many examples as one would like of the suppression of news. This does not mean, as I have just suggested, that the suppressed stories appear nowhere in the mainstream – though they sometimes do not – only that you can count on one hand the number of times they do make an appearance, thus raising questions about why they are not disseminated far and wide given the media’s proclivity to report each other’s reports. Let me give but a few examples of what can most plausibly be described as deliberate suppression of the news. (1) Why did Newsweek decline to run the story, which they possessed, of the Lewinsky-Clinton affair, while it was left to the Drudge Report to break it? (2) Why did the mainstream media, apart from Fox News, ignore the scandal of Van Jones, Barack Obama’s adviser on environmental issues, who had previously been given hagiographical reportage by the New Yorker and the Washington Post? It took the efforts mainly of the alternative media to uncover old videos and speeches revealing the less savoury side of Mr Jones’s politics. Did these mainstream publications have no idea of their existence? (3) Why, before the Madoff scandal broke at the end of 2008, was the only mainstream article questioning him a piece in Barron’s? Why did not a single other publication follow it up? (4) In 2009, David Barstow of the New York Times, no less, reported– according to the Pulitzer Committee which awarded him its prize in that year – that ‘some retired generals, working as radio and television analysts, had been co-opted by the Pentagon to make its case for the war in Iraq, and ... many of them also had undisclosed ties to companies that benefited from policies they defended’. Not a single major radio and television news organization followed up the story – not ABC, CBS, NBC, MSNBC,CNN, or Fox. Why? Perhaps because the retired generals of whom Barstow spoke worked for them. Again, examples can be proliferated. It is, of course, difficult to prove conclusively that a story has been spiked. It’s not as though an editor is likely to say to a journalist, ‘I’m not running your story because it criticizes one of our advertisers/the government is coming down hard on us/what you say is” politically incorrect”’. The editor can always find a pretext, e.g. lack of space, bad writing, the story isn’t a priority at present, and the like. One can only assess the circumstances and make a reasonable deduction. It might be objected that in many such cases at least one mainstream media outlet reports the story, and it does eventually become widely known. Well, we simply have no guarantee that this happens in every case, and even if it does this does not excuse all the other organizations that do not disseminate the story or supplement it with further research. Again, might incompetence or bad judgment be the cause? Perhaps, but unlikely. Stories such as those mentioned are just too big, too juicily newsworthy, and the organizations concerned too full of intelligent and savvy people, for anything but some sort of premeditation to be counted the most likely explanation. It is well known that, with the dwindling number of reporters on the beat, the result of cost-cutting being forced on the mainstream media, the latter relies more and more heavily on press releases for its stories. Two categories in which this is rife are science and finance reporting. Ben Goldacre has tirelessly tracked how corporate-sponsored releases by scientists, or worse, scientist-sponsored releases by corporations, exaggerate the conclusions of published scientific research, make much of trivial results not worth a second’s attention, and mix fact with advertising to push some product or service. In finance, one need only scan the business pages of any major newspaper, the Financial Times not excepted, to see that a substantial portion of its stories consist of topped and tailed, otherwise verbatim transcriptions of regulatory news releases by companies. Anyone with an ISP and a mouse can find these releases with a couple of clicks. They are news, to be sure – news reported by the companies whose releases they are. They are not news reported by newspapers; they are just more second-hand, unanalysed words subject to minimal editing and evaluation. True, the decent business sections also have columnists who break down the numbers of some of the better-known or larger corporations. But if the resources and will were there, every corporate news release would, to some degree, be fact-checked and analysed, and at least some of the grosser inaccuracies corrected. Yet the will and resources are not present, as we all know. The money for genuine, first-hand news gathering and fact checking is continuously slashed as the mainstream media fights for survival. The downward spiral is evident, as the more resources for genuine reporting are cut, the lower the quality of the end product, the less willing are the public to pay even a penny for it, and so with revenues plunging more cuts have to be made. Still, I wonder how costly it is, at least for print journalism, to engage in first-hand reporting. How expensive would it be for a journalist to take a train, second-class, to the headquarters of a multinational, and ask the CEO why his cash flow statement does not square with his profit and loss statement? Well, we know what would happen: the CEO would show this upstart the door forthwith, he would no longer be welcome at any official corporate event, and be denied all future access to executives of the company. So much for his career as an intrepid business reporter. Similarly, as we saw during the Iraq war, reporters who showed any seriously questioning attitude toward the policy at the time were denied access to military commanders and scoops, with the rest pooled together into official, government-controlled groups who could be carefully monitored. The alternative to maintaining one’s journalistic integrity is surely the safer route, but journalists do regularly jump ship and end up in the less well-paid, less prominent, but perhaps more professionally satisfying alternative media. As Chernyshevsky would have said, ‘What is to be done?’ There are no easy, pain-free ways for the mainstream media to regain its integrity in the eyes of the public, who now, able to vote with their wallets, increasingly attribute to its content zero monetary value. Part of this problem has nothing to do with the media and its ethics, but with the history of the Internet and people’s attitudes to it. Nevertheless, it is not as though people are never prepared to pay for anything online, including books. So there is nothing special about the supposed insubstantiality of text. What is more worrying is the insubstantiality of what passes for news. Copies of copies of yet more copies is how Plato might have characterized much of it.Is the media scared of the light? Of course not, since it engages in much highly substantial, obviously important, and thoroughly newsworthy reportage. What I am presenting here should in no wise be seen as a blanket condemnation of the mainstream media. One only has to think of the coverage of the recent MP expenses scandal in the UK to realize how brilliantly relentless and spectacularly worthwhile the mainstream can be when it locks onto an issue of genuine importance and does not give up until the facts come out. This kind of first-rate professionalism, however, of which there are many more examples, is regrettably mixed up with even more content that is unprioritized, unreliable, politically biased, financially influenced, and/or utterly trivial and unworthy of a moment’s notice by anyone. To the challenge that this reflects a serious decline in journalistic ethical responsibility, it might be replied that it is not for the media to decide what is newsworthy and what is not. To prioritise is to dictate, to separate the coffee from the froth is paternalistically to tell people what, in the opinion of their superiors, they ought or have a right to know. There is some truth to this, as no one should wish to return to a media that was arguably even more controlled several decades ago, led by grandees who thought they knew best what was in the public interest. What would help, on the other hand, is the deconstruction of the handful of mega-corporations into whose hands so much of the media is concentrated. Antitrust and anti-monopoly laws pertaining to the media are tame when compared to, say, retailers and banks. A limit on the size of media corporations, including a severe cap on the number and range of outlets they may own, would encourage competition and diversity, such as we find in the quirky and unpredictable, yet refreshingly educative alternative media. We might not get a sudden reordering of priorities, but more competition may give the more thoughtful and serious members of the profession a chance to reflect on what they serve to the public. In addition, one does not have to be a paternalist to be able to engage in some rough prioritisation of stories. If it pertains to government and finance the presumption should be that it be reported, no matter how briefly if it is of less-than-nationwide significance. Digital storage space makes this easy. If it pertains to celebrity, sport, and show business, then the presumption, horrible to say, should be that it not be reported unless capable of being so done by the skeleton of willing journalists left to do it, the rest having been dragooned into serious news gathering. Do the public just want sport and showbiz from cover to cover, or have they been conditioned to want it? Perhaps it is a little of both, but there is nothing to stop those magazines and other outlets that specialise in reporting nothing but celebrity junk from continuing to do so, should the public’s appetite for it be found undiminished in the face of an onslaught of newly-minted, robust and serious reporting. Indeed, if the reborn, serious news organizations want to own a handful each of such adult comic books, then if they can stomach it and the revenue stream is there, why not let such products cross-subsidise the serious and important work? Were the great Plato around today I doubt he would, having cast his eye over the mainstream media, have pronounced the end of the world. Perhaps he would have looked rather mournfully at the chasers after shadows, shackled by their own minds and by what they wrongly, in my view, take to be an irreformable, trivially-minded public. He would have pointed to the exit, where a few beams of sunlight shine through. He would have asked the media professionals to look around, just once, and enjoy reality. Should they keep their heads firmly set and their eyes directed fixedly at the wall, he would not have declared an end to civilization as we know it, but he may well have announced the end of the mainstream media. David S. Oderberg is Professor of Philosophy at The University of Reading, England. This is the text of a presentation given in the seminar series ‘Journalism and Public Responsibility’ at Christ Church, University of Oxford, February 2010. The series was jointly organized by the The Reuters Institute for the Study of Journalism and The McDonald Centre for Theology, Ethics, and Public Life, both at the University of Oxford. Copyright © David S. Oderberg . Published by MercatorNet.com. You may download and print extracts from this article for your own personal and non-commercial use only. Contact us if you wish to discuss republication.